Once upon a time, Liverpool were the undoubted kings of football. Four European Cup titles between 1977 and 1984 cemented their place in history as one of Europe's most successful clubs. The eighteen-times English champions were feared across the continent, and played a brand of football which attracted fans from all around the world. The Reds were an unstoppable force of attacking power and defensive resilience. Whether it was the footballing wizard Kenny Dalglish, the ice-cool Ian Rush, or the hearty Emlyn Hughes, Liverpool always had a source of entertainment on the football pitch. Fast-track 32 years since their fourth European Cup title, and Liverpool had dwindled in stature, and in ability. Despite lifting the UEFA Champions League title in unprecedented circumstances in 2005, England's most successful football club has failed to lift the league title since 1990, when they were crowned as champions of England for the 18th time. The heroes of old had never been replaced in full. While new heroes were born in the form of Steven Gerrard, Jamie Carragher, Robbie Fowler, Michael Owen, Luis Suárez, Fernando Torres and Sami Hyypiä, they were unable to restore Liverpool to the days of old. An era of greatness had certainly come to a disappointing end. 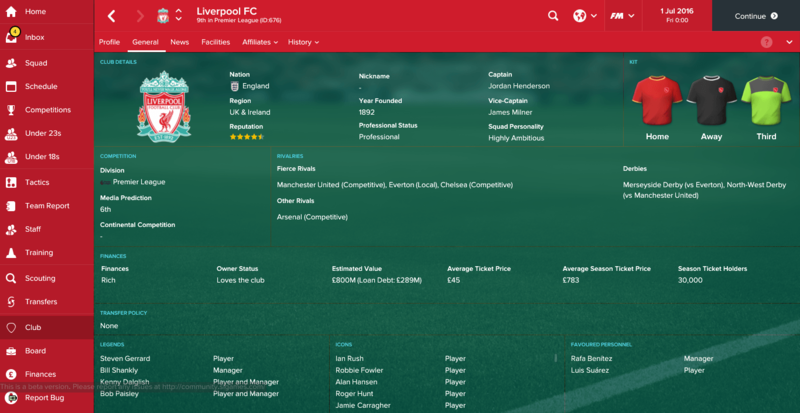 In FM17, Liverpool are not in such a bad state financially. New owners of the Fenway Sports Group, led by John W. Henry, took over the club during a time of true financial struggle in 2010, rescuing the club from near-certain doom. In almost six years of running the club, debts had been cut down to a manageable amount, and the club had begun making sizeable steps forward economically, as proven by the recent expansion of Anfield which took the stadium's capacity to a whopping 54,074, with the potential of future expansion to above 60,000. Liverpool are now at a place where they can begin to consider battling the likes of the two Manchester giants, and their rivals from London, in the transfer market. Liverpool can now, as has been proven in recent years, spend big to bring in desired targets. Depending on what you would like your expectations for the season to be set at, you can start with a transfer budget from anywhere between £40M and £62M. Of course, you may alter the transfer/wage budget difference in order to increase that maximum transfer budget threshold to an incredible £125M. This is quite a generous budget to be given in your first season in charge, and you should certainly use it wisely. 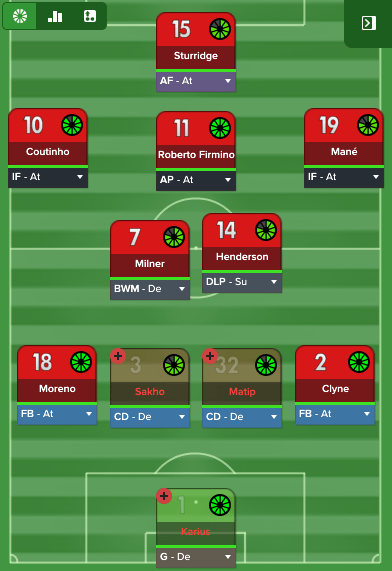 In the opening ten games of the current Premier League season in real life, Liverpool manager Jürgen Klopp has opted for a 4-3-3 formation. With Alberto Moreno demonstrating defensive vulnerabilities, the ever-so-versatile James Milner has made the DL position his own. A midfield trio of Jordan Henderson, Adam Lallana and Georginio Wijnaldum offers plenty of energy and a high work rate, with the ability to move the ball forward at pace, as well as being able to control the play and hold on to possession. This midfield trio could be accused of lacking a strong defensive edge, but this is an aspect which captain Jordan Henderson has improved on in recent seasons, while there are more defensive options in the squad in the shape of Emre Can, Lucas Leiva and Kevin Stewart. The attacking trio of Liverpool has been given much praise, with Sadio Mané and Philippe Coutinho playing as Inside Forwards, although with a very different set of skills. Roberto Firmino is the central attacker and while it could be argued that he plays as a False 9, I see him as a central forward who does not run behind the defenders too often, hence why I have allocated him the Deep Lying Forward role. These three players should interchange positions comfortably, and use their different sets of skills to unlock the opposition defence. Perhaps a more orthodox system to use would be a 4-2-3-1 formation. 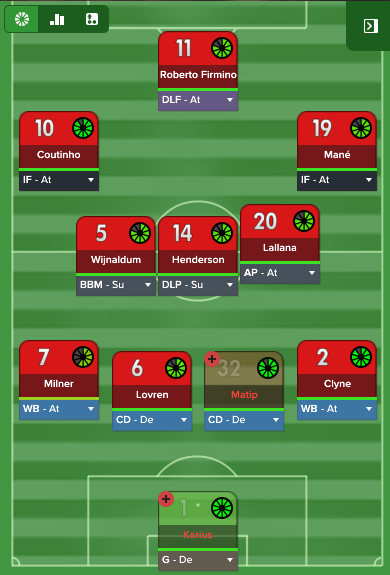 Using an Advanced Forward up top allows for you to make use of other forward players, most namely Daniel Sturridge, and it gives you different ways of attacking. There is a little less strength-in-numbers in the centre of the pitch, but this can be made up for if you use a competent Ball Winning Midfielder. This formation has been the hallmark of modern day tactic-creation, and is certainly easy to work with and to build a squad around. Your best goalkeeper at the start of the game would probably be Simon Mignolet. Loris Karius joined the club in the summer and has potential to become a top goalkeeper, but his relatively weak Handling skills makes him a weaker option than Mignolet at the minute. You might feel the need to improve on this position, but it certainly shouldn't be your primary concern. Alexander Manninger also makes for a fantastic third choice goalkeeper, while Danny Ward and Ádám Bogdán are both out on loan for the first season. If you do not plan on using these two players in your squad, they could still make you a nice amount of money from player sales, following the first season. Nathaniel Clyne is one of the best full-backs in the Premier League and you can rely on him to consistently perform well. You would be hard-pressed to find a player who could usurp him for the starting position without spending a large sum of money. With Jon Flanagan and Andre Wisdom both out on loan, Trent Alexander-Arnold is your best back-up option for Clyne. The 17 year old is very highly rated and could become a star player for you in the future. You may, however, feel the need to bring in a more experienced player to cover for Clyne until Alexander-Arnold is at the level where you feel he can perform well in the Premier League. The arrival of Joël Matip in the summer on a free transfer has been praised highly. The Cameroonian defender is a top notch ball winner, and provides a strong presence in aerial battles, one which Liverpool have lacked in recent years. Dejan Lovren's form last season has seen him labelled as a key player for Liverpool, while Mamadou Sakho certainly has a claim for a starting spot. Ragnar Klavan offers experienced back-up, while youngsters Joe Gomez and Tiago Ilori add great depth. Unfortunately, Alberto Moreno is the only recognised left back in the squad, and he has been the subject of much criticism in recent months. While the Spanish full-back possesses wonderful attacking qualities, his poor marking, positioning and defensive awareness has been a chief benefactor in Liverpool conceding goals. While Klavan, Milner and Gomez can all fit in to this position, signing a strong left back should be a priority. Liverpool possesses wonderful depth in the centre of the park, with captain Jordan Henderson and vice captain James Milner more than comfortable of playing in any role here. Summer signing Georginio Wijnaldum adds fantastic energy to this position, while Adam Lallana has also found himself playing here regularly. Defensive options in the form of Emre Can, Lucas Leiva and Kevin Stewart give a variety of alternatives, while the highly rated Marko Grujic is also more than capable of stepping in and producing the goods on the big stage. There is absolutely no need to go looking to improve your midfield in the first season or two, as Liverpool already hold all the answers for the future there. Behind the striker, Liverpool have an abundance of talent. Philippe Coutinho headlines this set of players, and the Brazilian is more than competent at playing centrally or on the left, producing assists or goals in either position. Fellow Brazilian Roberto Firmino may have found himself up front this season, but he can certainly play behind the striker too, or on either flank. Adam Lallana and Georginio Wijnaldum have also proven in recent years that they can play in these positions, while summer signing Sadio Mané adds an extra dimension on the right, with his electric pace and dribbling ability. Youngsters Sheyi Ojo and Ovie Ejaria could become starters in these positions in the future, while the highly-rated Lazar Markovic is currently on loan at Sporting CP. You may find the need to add one more wide player, who can offer a different dimension to the playmakers already in the squad. You have many striking options up front who can produce the goods for you on a regular basis. Roberto Firmino offers a more creative outlet up top, while Daniel Sturridge is tricky on the ball and a very composed finisher. Divock Origi offers plenty of pace and power while Danny Ings gives a high work rate and a never-say-die attitude. Sixteen year old Ben Woodburn is one for the future, and is certainly a player who you should give regular game time too, as he could become one of the best strikers in the world one day. Due to the high number of striker options available, I recommend you do not look to bring in another. 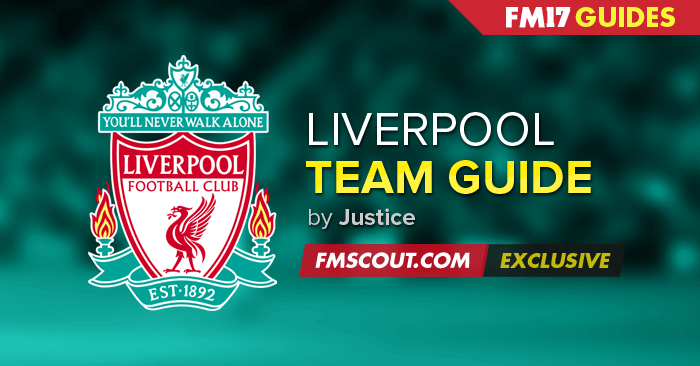 Liverpool have a very strong squad, and you are offered a fantastic budget to work with. If you can improve the depth in both full-back positions and keep your players fit and firing, there is no reason why you cannot make the Top 4 in your first season. With the increased competitiveness in the Premier League in recent seasons, challenging for the title might be just one step too far for your squad, but it is certainly doable if you can consistently lay down a marker in the Premier League. Having no European football benefits your squad, in terms of retaining fitness levels, but ultimately you do want to be competing in Europe, and your objective for the first season should be to make this happen. karllevy92, the formations shown are just two suggested formations with line-ups for the current Liverpool squad. I did not recommend full tactics, but I am sure you can find tactics which suit what you're looking for in our Tactics Download Section. what are the team instructions for the formations?